In an on-demand world, even minor delays in response times for your applications can lead to unacceptable losses in productivity, customer satisfaction, and sales. Traffic inadvertently routed to failed servers often gets lost without notification, entering so-called network “black-holes.” Solutions such as a global server load-balancing (GSLB) appliance or an Application Delivery Controller (ADC) can address many of these problems. However, most traditional GSLB and ADC appliances are standalone solutions and are deployed and managed separately from your DNS-related systems. This approach significantly increases capital and operational costs. Infoblox DNS Traffic Control brings application response times and performance to the next level. It uniquely combines load balancing functionality with the industry’s leading DNS management platform for a single, unified solution—and for a less than a third the cost of a traditional ADCs. Elevate customer experiences by ensuring timely application responses whether within your corporate network or over the Internet. With Infoblox DNS Traffic Control, your application traffic is intelligently directed to the ideal server in every instance based on multiple parameters, such as client and server proximity and server availability. Improve the responsiveness and performance of all applications, including video, by optimizing traffic distribution across your network. For external traffic, Infoblox DNS Traffic Control directs your traffic to the optimal data center based on location, geography, and other parameters to significantly improve response times. Ensure that people can connect to your applications and Web sites without delay in any circumstance. Our solution continuously monitors your network to detect availability issues with servers and data centers. In the event of a disaster or other malfunction, external Internet traffic or internal application traffic routes automatically to optimal alternate sites or servers, based on analytical performance insights. Your traffic never slips into black holes. You also get the visibility and predictive analytics you need to better manage server response times, availability, and capacity. Simplify administration and slash expenses by managing global server load balancing and DNS using one unified solution—without the need for a separate appliance. With Infoblox, you can control load balancing through the same centralized management console employed for all configurations related to DNS, IPAM, and DHCP. Handle it all with one platform and maximize your return on investment. Only Infoblox offers the capability to ensure that application traffic automatically routes to ideal servers in every instance. It offers unique integration between global server load balancing capabilities and IPAM to optimize application responses by including factors such as client location, server availability, and policy configurations in load balancing decisions. Accommodates round robin, ratio, global availability, and topology. Provides out-of-the-box integration with HTTP/S, SNMP, TCP, UDP, SIP, and ICMP. 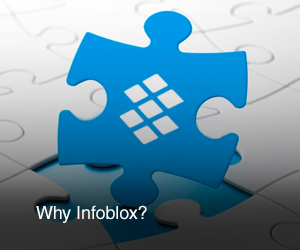 Integration with Infoblox IPAM make it easier to configure servers and topology rules. Enables centralized management for enhance operational efficiency via a unified UI for the entire enterprise. Provides metadata such as location that can be used for effective load-balance decisions. Ready to learn more? We can help you.